Protein is vital to your baby’s growth. During pregnancy, protein and amino acids are needed for the placenta. Your baby’s physical growth depends greatly on protein. Taking in 80 grams or more of protein every day can virtually eliminate the chances of experiencing pre-eclampsia or toxemia during pregnancy. This alone is a crucial benefit of monitoring your protein intake during pregnancy. A woman’s blood volume increases dramatically during pregnancy, and protein is a necessary part of producing the right amount of blood cells. Most women have a daily protein requirement of at least 60 grams. Many pregnant women will even benefit from taking in 80-100 grams of protein every day. It’s not difficult to meet this requirement during pregnancy. A serving of chicken or beef has approximately 30 grams of protein. Cheese, yogurt, milk, and other dairy foods are also great protein sources. You can also get your daily recommended protein during pregnancy by eating eggs, nuts, beans and fish. 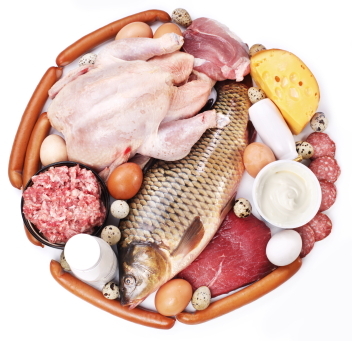 A balanced protein diet is important, so try to get your protein from a variety of sources during your pregnancy.